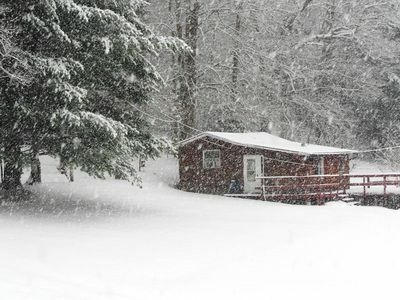 Carroll County year-round Cabin Getaway near Amish Country and Pro Football HOF. This cabin is a great location as a home base for many adventures and interesting sites. Located 1/2-hour from all the attractions in Amish Country, and the same to Canton and the Pro Football Hall of Fame, First Ladies Museum, McKinley Museum, great restaurants, etc. Atwood Lake East Marina is 0.8 miles from the cabin, with boat and pontoon rentals. In winter, cross-country skiers can go back-and-forth on about 12 acres of open land, or if you are a hiker, there are 43 acres with a open paths, plus another 40-acres of public wooded land that abuts my property. Live theater is available within a 90-minute drive in Cleveland and Pgh., as well as professional sports there. Those wishing to do none of the above, to just decompress for a few days or a week will find this ideal. Very peaceful, scenic, bucolic setting. You truly can do as much or as little as you want. Picture yourself sitting on the deck, glass of wine in hand, watching a beautiful Carroll County sunset, or watching the flames dance over the outdoor fire pit, which will be lit and waiting for your arrival. I hope you'll give it your consideration, and I look forward to hearing from you. ALL are welcome, and I DO mean ALL. HEARTLAND ON HERITAGE RETREAT LODGE & BARN EVENT CENTER; WEDDING VENUE! Renovated Modern 3 bedroom Cabin/House with 2 floors, New Kitchen with all appliances including dishwasher, large fridge, electric stove, Marble fireplace with seating for 4, 2 new full bathrooms - one with stall shower and one with tub/jacuzzi, new windows, new roof, Large family room 12' X 22', kitchen table seats 8, new clothes washer and dryer, new floors throughout, fire pit in front of house, walk to private beach - 5 minutes. Beach is small, but not highly used, no lifeguard. Awesome Leesville Lake is 1000 acres with 2700 acres of Land. 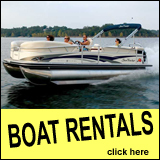 2 marinas on lake - boat rental. Master bedroom has queen Tempurpedic bed, Full bed in second BR and 2 singles on first floor. Town is 10 minute drive. Quiet and Serene - Great place to get away from it all, but cell service isnt good except for Verizon. Small beach for association - no lifeguard, 1 hour 20-40 minutes from East side of Cleveland. 2 hours from West side of Cleveland. 2 hours from Columbus and Pittsburg as well! New Deck in front of house July 2017 - aluminum tables and chairs on deck, alsothere are 6 folding camp chairs for fire pit, 3 hanging chairs, a two person hammock and 2 zero gravity chairs. House is on the lake road on the non-lake side, but is beautifully situated in the trees on a hill. DRIVEWAY IS ON KNOLLWOOD, ONE STREET BEFORE ROCKWOOD DRIVE. ADRESS IS ON BACK OF HOUSE AS WELL AS FRONT No Bachelor parties or partiers! No pets of any kind. No smokers - any of these types of guests will not receive their security deposits back. Sorry! Please be advised that house is on a hill and that the fire pit is below the house and on the hill which may be an issue for the elderly. The grass on the hill may be slippery when wet. No Dogs/Pets. Only Verizon service works in house and on parts of lake. 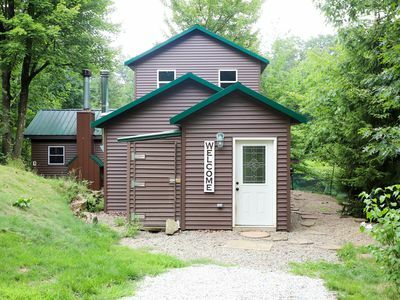 Enjoy a rustic and comfortable quiet getaway at Leesville Lake in Carroll County Ohio. Our authentic 1960 cottage is a hidden gem and is situated on a wooded acre and has all the amenities you need including full kitchen, bathroom with shower, large deck, Weber grill, hot shower, TV and DVD player and screened porch. It comfortably sleeps 6 people. Stroll down the hill to a private community beach. 2 DAY RENTAL AVAILABLE WITH 2 DAY BOAT RENTAL - Please contact me with dates to make arrangements. Our premium Bennington 20' pontoon boat is available at an additional $145 per day plus $25 fuel fee per day. There is also a Hobie tandem kayak available for $35 per day. Boat available after April 30th when docks are put in. 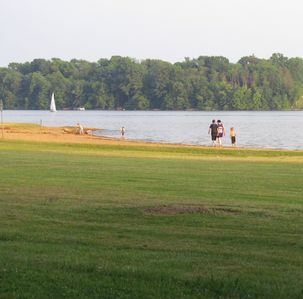 Leesville Lake is one of Ohio's premier fishing lakes. It's over 1,000 acres of water and carries a lake-wide 10HP motor limit making it a quiet and safe place for everyone to fish, ppl kayak/canoe and swim. 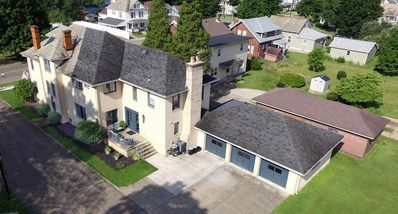 Our unique house is located in the heart of the Tuscarawas Valley. We are within minutes of many local golf courses, Amish Country, Warther’s Museum, Zoar Village, Tuscora Park, Hiking and Biking Trails, Pro Football Hall of Fame, Atwood Lake, Schoenbrunn Village, Trumpet in the Land, shopping, restaurants and several Wedding Barns. The space The pool will be subject to availability. The pool is available majority of the time unless we would be having a party. Although some guest have even joined our parties. Guest access Washer and Dryer can be avaliable upon request. Interaction with guests We are happy to help with any information needed to make your stay more comfortable. Other things to note The bedrooms are up a flight of stairs. There are 3 steps to go up to get into the house. We can be handicap accessible on the first floor but not to the bedrooms. 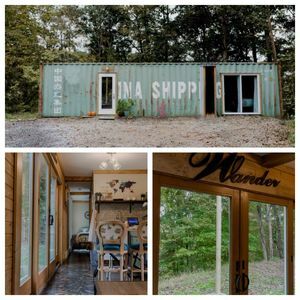 SHIPPING CONTAINER TINY HOUSE Riverside Hideout is a thoughtfully constructed shipping container home tucked into the woods & hills near the Tuscarawas River. Check back for finished space! Located near Tow Path trails, HOF, Amish Country, Atwood Lake, Tappan Lake, Historic Zoar, Swiss Festival. The space The container is equipped with a private Queen bed and spacious unique bathroom. The fully stocked kitchen is complete with a hot plate, toaster oven, Keurig and a large mini refrigerator. The bar top rests upon an old bicycle frame. The container offers no wifi or TV but has all of the other modern amenities! There are books, magazines, board games and cards! Heating source is base board. Cooling source is air conditioners. The air conditioners are also dehumidifiers and mostly run all the time. Please see house rules regarding check out and the heating/cooling. Guest access You will have complete access to the whole container and the immediate surroundings. The space immediately around the Container is yours to explore (less than 100 yards). Absolutely no parties. No overnight guests past the 4 person occupancy. Fires must only be within the fire ring. Please extinguish fire with water and never leave it unattended. NO SMOKING INSIDE THE CONTAINER. Please be nice to my bathroom door, it is 100 years old. The Container is cleaned and linens are washed with either Norwex cloths and Norwex laundry detergent OR Melaleuca cleaning supplies and laundry detergent. Thieves oil is available for you to clean as needed. We do not provide paper towels, but several cleaning reusable towels. DOGS: They are welcome! They MUST remain leashed while outside and CANNOT be left unattended in the container. You must clean up after your dog inside and outside. There are other dogs around and the road is close. You will be held responsible for damage done by your dog. I have provided a poop scooper. NO MINORS (under 18 may not place the reservation), they also must be accompanied by an adult, over 18 at all times. Do not leave children unattended. NO UNREGISTERED GUESTS. The cost to add an extra guest is low, just do it. Sub leasing is not allowed. ** Speaking of Extra Guests. The extra sheets and comforter for the pull out sofa are under the lounge side. You may leave them out when done. Pack and play for use, your infant/child does count as an extra guest. $10. Please tell me if you want the Pack and play set up ahead of time. There is limited space. CHANGES: Once you confirm, you need my approval to change your length of stay or number of guests. Altering these could result in a cancellation. CANCELLATION POLICY: Please see the cancellation policy. VROB fees are not refunded, ever. GUEST CHECKING IN: The day of your arrival I will send you a code for check in. I will not meet you at check but with notice or reason, I may ask for proof of ID of registered guests. CHECK-OUT: I would love a quick in app message when you head out. *Please wash and dry all your dishes and place them back onto the shelves/cabinets. *Please place all used towels in the metal basket in the bathroom. *Please turn the heat down to 55 when you leave (Winter Months). *Please turn the air up to 76 when you leave (Summer Months). *Please take one more look around for your belongings. *Please be sure both slider doors are locked. * I will handle the trash and linens. Rustic brick and timber lodge, beautifully decorated, with floor to ceiling windows capturing the amazing woodland view. An Oak Leaf, the ancient French symbol of welcome and hospitality, adorns the door, bidding you welcome to the timeless setting. 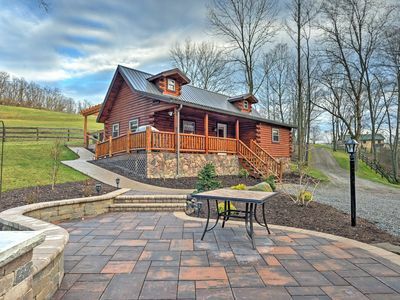 Nestled in the woods, the home sits high on a hill overlooking the beautiful Tuscarawas River Valley. Enjoy the songbirds and white-tailed deer...sip coffee on the secluded terrace...go antiquing and explore old barns filled with treasures. A gazebo and fire pit await outside. Inside, enjoy a baby grand piano. Guests love to wander trails marked by deer or pick berries in the surrounding fields. Others watch the sun glint off their golf balls at the adjacent courses. Begin your day with an amble through the countryside, enjoying fresh air and the beautiful scenery . A crackling fire, wineries nearby, gorgeous trails to hike or bike, and fabulous restaurants make this destination fun for everyone in your party. Relax in serenity here! The main level features 4 bedrooms: a Queen with bath attached, a King with a twin daybed, a Queen with woodland views and a Full size room. There are 2 additional hallway baths on this level, along with a spacious living room/dining room and a fully equipped kitchen. The living room has cathedral ceilings, floor to ceiling windows on 2 walls and a wood -burning fireplace on a third wall. It is open to the dining area, with tables and chairs to seat 15 or more. A baby grand piano is featured here as well. The next level has a second living room with another fireplace and a table to play cards or work puzzles. The sofas in this living room are not to be used to sleep on. There is a terrace outside overlooking the woods. This level also has 2 bedrooms, both large rooms with a queen bed in each. There is a hall bath with double vanities outside these rooms. Outside, the house and 2 acre lawn are shaded with large oak trees.There is a relaxing gazebo to take in the view or enjoy some quiet time. Plenty of room to toss a ball, play horseshoes, etc. No other houses are in sight or nearby. Parking is available for up to 12 cars maximum on the property. Please note, parking for RVs is not available. 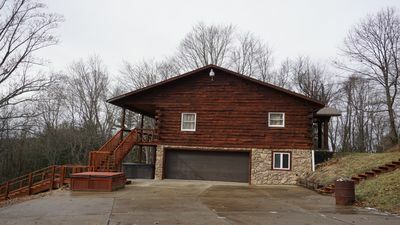 *Price is based on 8 occupants* --Ask for children prices Deerwood Cabin is a new cabin rental in New Philadelphia, Ohio. Come experience this beautiful 10-acre wooded wonderland. 2,000 square feet freshly stained and sealed interior with vaulted wood ceiling. Easy access to restaurants and shopping plazas, and just minutes away from Tuscarawas River! Sleeps 20 people comfortably. Includes five bedrooms; 2 king size beds and a pull-out sofa in each room upstairs which sleeps 4 in each bedroom, 2 bunk beds (twin over queen) located in the downstairs bedroom that sleeps 6, pull-out sofa in living room sleeps 2, two bedrooms downstairs with a queen bed in each. 3 full bathrooms (1 upstairs and 2 downstairs); 3 showers and 1 bathtub. 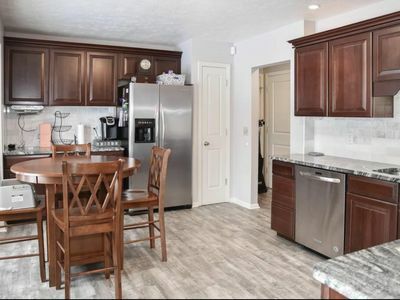 Features a fully equipped open kitchen with island, complete with a dishwasher, microwave, toaster, grind coffee maker, electric stove with oven, and refrigerator. Dinnerware (porcelain plates, cups, pots, utensils, etc.) are provided. Dining room includes a 12 person dining table. Large living room with couches that features a wood burner fireplace, foosball game table, smart 50 inch TV, and a walk-out porch with a gas grill. 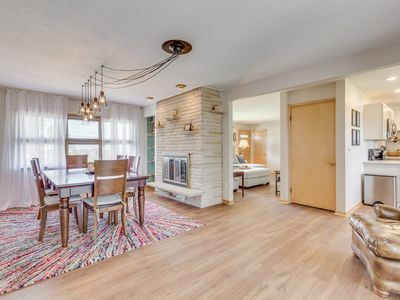 Large walk-out basement with a wood stone fireplace. 8 person hot tub on downstairs porch overlooking the woods. New stone fire pit surrounded by benches. Electric heaters with thermostats in each room. Wi-Fi internet access. Kitchen and bathrooms remodeled with all new granite countertops. Book your stay today! Woods. Water. Privacy. This is What You're Looking For. Welcome to the Cabin at Maple Pond. No matter the season you will find woods, water, and privacy from the outside world. 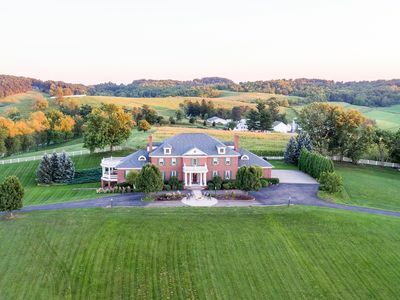 Hidden on 19 acres of wooded property, we are minutes away from historic Zoar Village, Zoar Village Golf Course, Fort Laurens, The Ohio and Erie Canal Towpath Trail, and Amish Country. Only 25 minutes to Canton and the Pro Football Hall of Fame, less than an hour to Akron, and one and a half hours from the Cleveland area. Columbus and Pittsburgh are 2 hours away. You will be 20 minutes from Dover/New Philadelphia and Atwood Lake Park. We are easily accessed from I-77 (7 minute drive off the interstate).A pole barn fronting the property provides ample storage for any equipment, trailers, or campers. 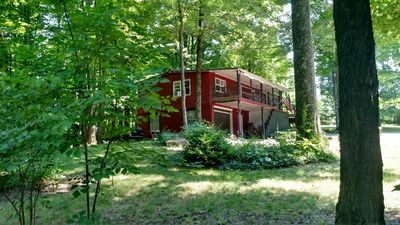 Follow a private 800 ft driveway through the woods to our hidden two bedroom, one bathroom cabin overlooking a 2 acre pond. Comfortably sleeps 6. Cabin has a large living room and an eat in kitchen. Clothes washer and dryer on premises. Sleep in comfort year round with our brand new electric AC and furnace. Enjoy a quiet evening by the water, walk any of the small trails, cook hot dogs and marshmallows, or visit nearby attractions. The cabin DOES NOT have internet or TV/cable, but receives excellent cell reception. Our cabin is the place for kids to run around, catch frogs, tadpoles, and minnows. Watch the water bugs glide around the water. Kids thrive in the outdoors and this is the place to get wet, dirty, and play. At night the frogs create their own music loud enough to sing you to sleep. THE DETAILS The property is fronted on the corner by a pole barn. Ask prior to your arrival if you would like to store any equipment in the barn during your stay. You will need to bring your own padlock for the door. It can accommodate vehicles, trailers or campers. The private drive way is located just past the pole barn. Look for our cabin mailbox! It weaves 800 feet through the woods to our cabin. 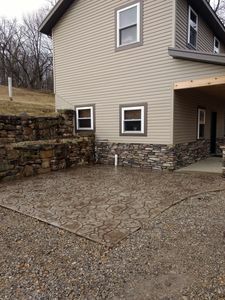 The driveway has been newly reworked stone and is easily accessible in most weather conditions. If there is heavy snowfall we have the drive plowed to ensure access. Before reaching the cabin there is a small clearing on the left hand side of the drive. This area is a perfect spot for tents and camping. If you wish to stay with more than 6 people, please contact us and we can review your plan. There is a trampoline located at this site, however use at your own risk. A large gravel parking area and fire pit is set next to the cabin. There are also a number of trails that start from this location and wind through the property. Remember you are in the woods now so watch out for poison ivy! When you walk down the small hill you will see the cabin. The door on the left is a wood shed. 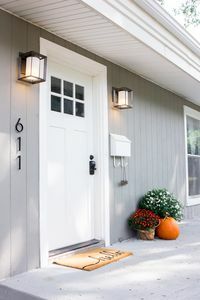 The door on the right is for the mud room. The mud room has plenty of space to hang coats and store shoes. Go through the second door and you will enter the living room. It is newly remodeled and furnished. A large window overlooks Maple Pond. In the cabinet there are many games to play during your stay. The wood burning stove is NOT for use during rentals. We have a brand new heating/cooling system that will keep everyone comfortable. Walking through the living room you reach the kitchen. The kitchen is loaded with all new cooking supplies. There are pots, pans, cookie sheets, utensils, cutting boards, colander, bowls, casserole dishes, plates, cups, Crock Pot, coffee maker, food processor, water jug, and starter spices, oil, and coffee. Don’t want to do dishes during your stay? Good news. We have a dishwasher too. The cabin has well water. If you are not used to well water it may taste different. It is perfectly clean and safe to drink. The dining table has four chairs and a bench to seat 6 people. There is a large sliding glass door that provides a great view from the kitchen. The thermostat is located in the kitchen. Off the kitchen is the one bathroom. It is fully remodeled and brand new with a sink, toilet, and shower/tub. The shower head is magnetic so it easily detaches to make cleaning kids extra easy. Off the kitchen is the first floor bedroom. This room was the original cabin that was built on this location. It is wood paneled and has a (non-working) fireplace. The bed is a new queen mattress. In the closet are the washer and dryer with starter laundry soap and dryer sheets. The sliding glass doors open onto a covered deck. On the deck is the hammock, our favorite place to relax. The view from this location is the best on the property! We have spent lots of time just laying in the hammock listening to the birds and frogs. Upstairs there is a queen bed with a new mattress and a bunk bed with new mattresses. There is a large closet to hang or store clothes during your stay. Outside the cabin off the kitchen there is a new deck with a table and chairs to enjoy your meals. The deck is a great place to hang out and watch the water. Off the deck you will go down stone steps to a small dock. You can rest on the bench, watch the water bugs, or launch a kayak from this spot. The dock has a ladder for entering/exiting the water. The Maple Pond drops off quickly and gets quite deep. Swim at your own risk and always wear a life jacket. Circle around the back of the cabin and you go down stairs to a second dock. Tucked underneath the house is a porch swing where you can enjoy looking out over the lake. This area is the cove and has been cleared out and is our mini beach for digging and playing for our smaller guests. Under the house is a supply of pool noodles. There are currently 1 adult kayak, 1 canoe, and 1 kids sit-on-top kayak with a weight limit of 130 lbs. If you do use them, please treat them with care and return them to their location. Wear a life jacket while kayaking, even if you are a strong swimmer. Kayak and canoe at your own risk. Maple Pond is fully stocked and ready for you to fish. Bring your own poles and bait and get ready for the fish to jump onto your hook! EXTRA OPTION Food Supply: After driving to the cabin and unloading your luggage, the last thing you want to do is head over to the grocery store. We got you covered. We can do a basic breakfast/lunch/snack stock for you. Do you want more specific items? Do you want a full meal supply? Flowers? Chocolates? Let us know how we can make your stay more comfortable. 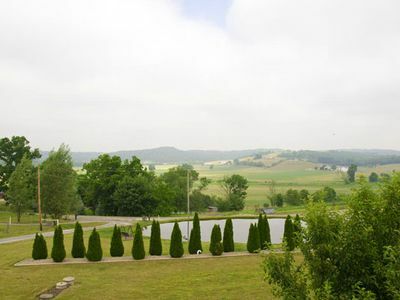 Updated Paris Farmhouse w/Balconies+Country Views! Beautifully restored historic home listed on the National Register. 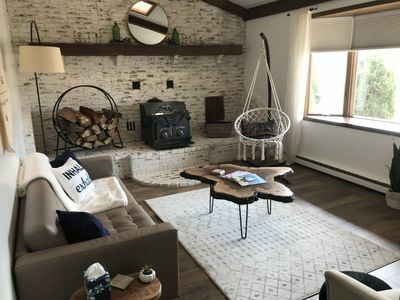 Farmhouse modern kitchen, three bedrooms (two with fireplaces) and two full baths upstairs, living and dining rooms all comfortably furnished with antiques and custom furniture. Shady backyard and covered furnished back porch, bbq grill, wrap around front porch and porch swing. It’s a perfect family vacation rental! Well behaved pets allowed with a $25 pet fee. Sleeps six. Tappan Lake Historic 19th Century Home In Quaint Deersville. Tappan Lake Historic 19th Century home in quaint Deersville, Amish Country nearby, beautiful Tappan Lake 1/2 mile away, perfect for weddings, fishing, hunting, spacious, 1 hour from Pittsburg. WiFi, Roku TV, large gourmet kitchen, steam shower, hot tub, fenced backyard, antiques and art. Ohio hill country beauty year round. Over four generations of my family have lived in this house beginning before 1900. 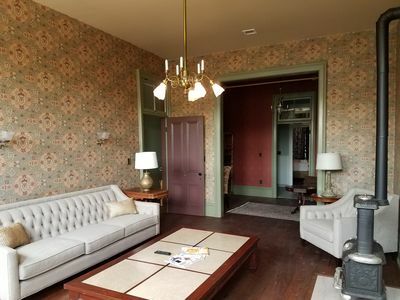 You can rent the entire historic home for a weekend or longer and enjoy the Ohio scenic byways and the Buckeye trail during the day, eat out in restaurants in nearby Dennison or New Philadelphia, or create your own masterpiece in our fully furnished gourmet kitchen. This is a rare gem and perfect for family reunions, hunting groups, weddings, or for weekend getaway- just you and your special love. 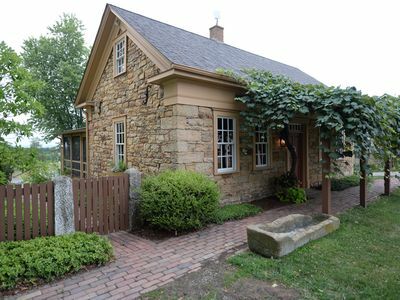 Cozy but roomy fully-furnished two bedroom cottage on a heartbreakingly beautiful 13 acre lot in Ohio's rolling Amish country. 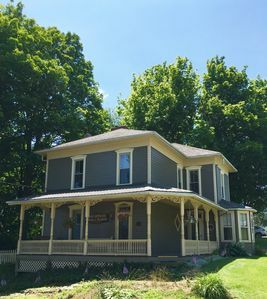 Located in the picturesque Victorian town of Deersville, five to ten minutes drive from fishing and boating on both Tappan Lake and Lake Clendenning and twenty-five minutes drive from the bustling burg of New Philadelphia, Fleming's Family Cottage is a peaceful, private haven. 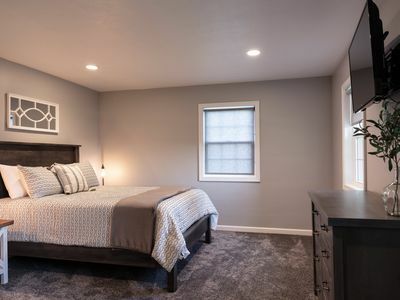 Sunlight pours in through the skylight in the huge upstairs bedroom, which features a comfy queen bed and a twin bed separated by a low partition. Two huge closets and a dresser invite you to stay for a while; An overstuffed chair and ottoman tempt you to sit and read or take a nap; A desk and chair with a tree laden window view beckons you to write or think; And a TV nook stocked with videotapes gives the kids something to do when they're tuckered out from their day at the lake. Downstairs, an elegant bedroom with a queen sized bed, a private window, dresser and roomy closet, connects to a bright, contemporary bathroom, with tub and shower and lots of cupboards. A bright and spacious modern eat-in kitchen looks out onto the stunning front lawn. The living room, with it's high ceilings, is comfortable and gracious, its window also framing the rolling, tree-graced lawn. But though the house is wonderfully inviting, you'll find yourself drawn to wander the beautiful forested property. Dotted with tall fir trees, maples and willow trees, the property is breathtakingly beautiful in every season. A winding, tree-shaded path leads you to a large, cattail-fringed private pond stocked with fish. Dragonflies zigzag in the warm spring and summer air. Further down the path, an old two-room log cabin (under repair, the happy project of the property's owner), built at the turn of the last century, intrigues you. Deer, safe from hunters on this land, dart in and out of the foliage, watching you as you follow the path up and over large and ancient rock formations, and make your way into a dense forest. Surrounded by whispering trees, and the occasional tap-tap-whirr of a woodpecker's beak tapping into hard wood, you will visibly relax. At night, the stars fill the sky, owls hoot, and pond frogs peep in a loud chorus, lulling you to an easy sleep. 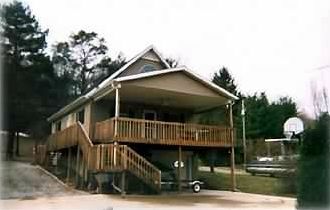 Amenities: Wifi, Cable TV (Direct TV), Washer and Dryer, refrigerator, new stove/oven, microwave, coffee maker, Charcoal Grill, Portable fire pit outside Cottage, Fire Pit at Pond, benches at Pond,. CD player, VCR and videotape library, books, board games, .,picnic table, Whole House Air Conditioning. Sheets and towels provided. Activities: One minute walk from the Deersville General Store (just up the hill) and their famous homemade ice-cream. 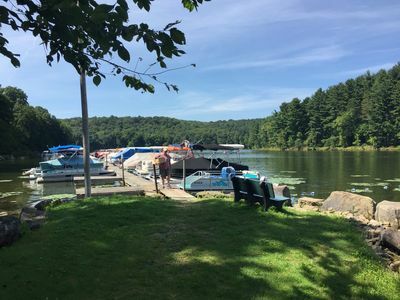 Five to ten minutes drive from boating and fishing on the majestic Tappan or Clendenning Lakes, where you can rent a boat and swim, water-ski or fish. The acreage on the property itself invites hiking; the large private pond is stocked with fish just waiting to be caught. For an excellent lunch and a tour of the Railroad Museum, visit Depot Town, fifteen minutes drive away in Dennison. New Philadelphia, with it's coffee houses, shops, movie theater, restaurants and busy summer entertainment schedule, is a scenic 25 minute drive away. 45 Minutes to an hour away is the heart of Ohio's famous Amish Country. Deersville is on the Register of Historical Places, and is one hour south of Akron, Ohio and one hour West of Pittsburgh, Pennsylvania. 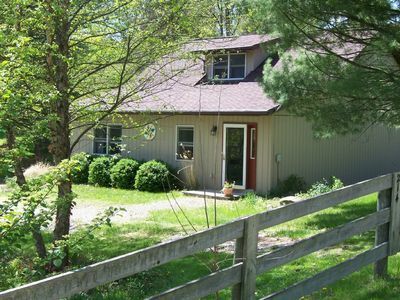 Country home in the woods, 4 Bedroom, 2 full baths 2800 sq. ft. sleeps 9. Upper level is open plan great room with full kitchen, stove, microwave , toaster oven, coffee pot, island bar and dining table , living room with couch and recliners and T.V. Four bedrooms on upper level, 1 queen bed, 1 full and 2 twin beds. Walk out full basement rec room with 1 full bed, 1 twin bed and a futon. Two foosball tables, air hockey, T.V., hundreds of family and classic videos, board games. Living area with group seating for 9. Open concept basement is accommodating for celebrations, events, retreats, gatherings, holidays, and get togethers. 2 Full bathrooms, one on each level. Washer/dryer, iron and ironing board. A park like setting in the woods, with picnic table, gas grill, and fire ring for creating family memories at the evening camp fire. White-tailed deer and wild turkey sightings abound in the area. 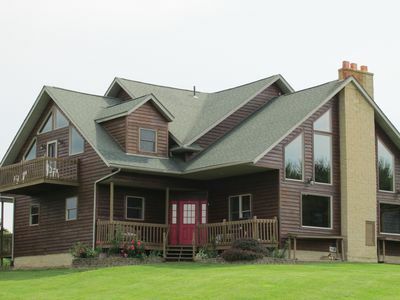 Three miles from Tappan Lake Park, 2 miles from Clendening Lake. Step back in time and visit the 120 year old Deersville General Store where you can indulge yourself in 12 flavors of world famous homemade ice cream. 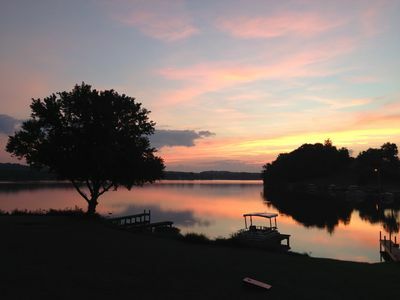 Whether it's a day of fun activity at the lakes, swimming, boating, fishing, hiking or just relaxing on the porch swing as the setting sun streams through the tall trees, there will be something for everyone to enjoy at your stay in the country. 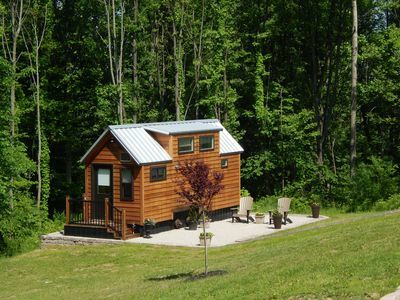 Klein Haus is a new tiny home set up by a tree line . Modern Farmhouse decor, Full size bathroom w Towels provided. Kitchen has Fridge, Microwave , Keurig w Coffee, Tea, Hot Choc K- Cups provided. Kitchen is stocked with basic supplies. Bedroom is in Loft area, a short flight of stairs . New Full size mattress. Clean , Sanitized Sheets & Towels after every guest. WIFI, . A/C for summertime & Electric heater in Living area & a smaller one in Bathroom for the Winter months. During warmer temps, one has a Patio area to lounge in. Klein Haus has it's own parking area. We are within 20 miles of Berlin, the Heart of Amish Country. If you have any questions regarding Amish Country, Ervin & Dina both were born & raised Amish, so we know all the local places that are great to visit. 20 miles to Canton, Ohio . where the Pro Football Hall Fame, McKinley Museum are located. Lots of unique coffee shops in Downtown Canton. We are 5 minutes from the Ohio / Erie Canal Towpath in Navarre, Ohio if your interested in walking, biking or Kayaking a historical area. Navarre has a few great Ice Cream places, Anderson's in the village is a quaint Coffee & breakfast spot . Main Street Cafe has amazing soups & sandwiches for Lunch. Enjoy a truly unique lodging experience in this relocated and resurrected c. 1820 log house and c. 1840 addition. Moved from Coshocton County, Ohio to our location in Tuscarawas County, the main structure recreates a pioneer atmosphere with authentic period furnishings and a romantic cooking fireplace. The adaptive reuse of the timber frame addition combines historic and contemporary aesthetics with modern conveniences. Whatever your style or preference, we aim to make your stay at our cabin a truly unique and aesthetically pleasing experience. 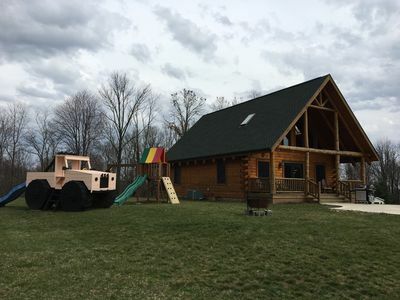 Located within the heart of Amish country, just 9 miles from Sugarcreek, Ohio and 19 miles from Berlin, Ohio our 150-acre farm and cabin offers convenience to great area attractions, but most of all prized, private tranquility and seclusion. Come, get away to a different era or relax with modern amenities. 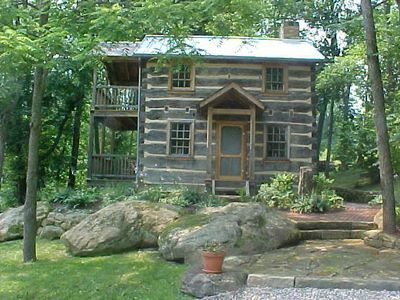 Sit in the log house and feel what it may have been like to live on the Ohio frontier. Imagine the workings of an authentically reproduced stone cooking fireplace but use the well-equipped up-to-date kitchen. Experience sleeping on an authentic rope bed or spread out on a contemporary queen-sized mattress. We offer a great location to read, write, make art, hike, observe nature or just relax. Whether you are looking for a getaway by yourself, as a couple or with your entire family, we can accommodate you. The air-conditioned log house provides sleeping arrangements for up to six people. 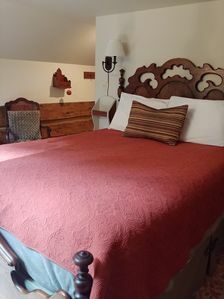 The main room has a full-sized rope bed and the second floor bedroom contains a queen-sized bed. A fold down futon couch is located in the sleeping loft of the addition. The timber frame addition has a fully equipped eat-in kitchen with solid wood counter tops, sitting area with comfortable reading chairs, a satellite TV with VCR and a private bathroom with great corner shower. There is also a washer and dryer for your convenience. Spring has arrived here at The Blue Door and the birds are overjoyed! Brew coffee your way, Keurig, traditional, or French Press, and sit on the porch enjoying the birds or the antics of our friendly cats. We have everything you need to do your own cooking at our Cottage; you just bring the food! I do provide food for a continental breakfast, including coffee, teas, hot chocolate, cereals, milk and OJ. Or if you'd rather not cook, you can find comfort foods that are prepared at Amish Restaurants near us or pick up some delectable treats at their bakeries. There are so many wonderful places to shop, dine, and visit while you stay in Amish country. We cannot wait to pamper you at our Blue Door Cottage! 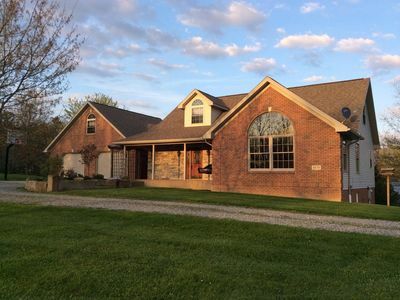 Happy to offer this house in beautiful Sugarcreek, Ohio. This is a two story home with finished basement. Master bedroom on the first floor with queen bed. Three bedrooms upstairs with 5 twin beds and 1 full. The basement has a pull-out couch queen bed, and bedroom with 2 twins. House is fully furnished with touches of the Amish country. Features two full baths, a full kitchen, dining room, living room, and a large back yard. Also has a television, air conditioning, laundry facilities, and Wi-Fi internet. New owner is a former customer who loved the house so much we bought it! 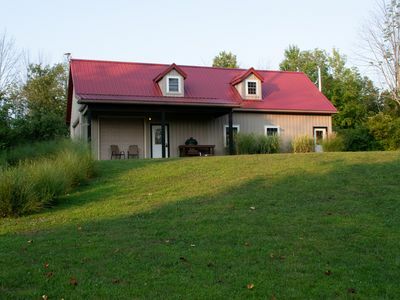 Fully furnished log cabin getaway in the heart of Amish country. Enjoy the peace and quiet of country living. Fully stocked kitchen,dining room,living room with scenic valley view & fireplace. master bedroom with 1 queen sized bed,large loft with 2 queen beds, large bathroom with washer & dryer, large rec room in basement with foosball and DVD player -no tv service-one car garage in basement. This cabin has it all !! !lots of room for the kids to play. Plan to stay as long as you'd like and unwind. 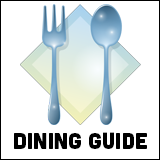 Cook your own meals, or make the short trip to one of many great Amish restaurants in Sugarcreek, Walnut Creek, or Berlin. Home away from home. This ranch style house has just recently been updated with all the lasted styles for a much relaxing and enjoyable stay. You can enjoy drinking coffee or tea ( provided by us) on the back deck while watching the horses graze in the nearby pasture. 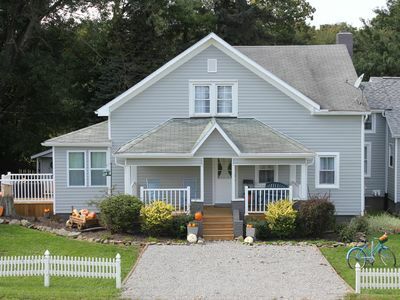 This property is located out in the country but within 10-20 minutes of Amish style restaurants and shopping. Also close by are golf courses and wineries. Within 1/2 mile of the guesthouse is Dundee falls and rocks where you can do some hiking or throw some hoops out on the basketball court on the property. We are right next door at if you would need anything! We enjoy families and therefore have a pack n play if you would need it, also family friendly DVD's are available. Welcome to the Football Hall of Fame City!! 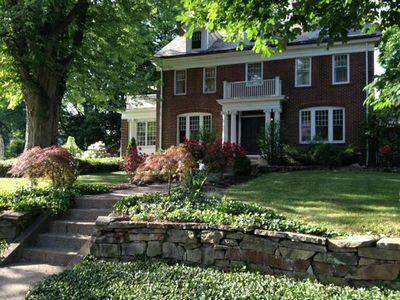 Our home is the perfect stay for your visit to Canton. WALKABLE to the Hall of Fame - less than a 10 minute walk and less than a 5 minute drive. Easy access to route 77 and just a skip away from shopping, dining, and Canton night life. Our home is perfect for larger groups. We can fit up to 10 people very comfortably. Fido friendly! Our home is family owned and we live less than 10 minutes away. We are around for any extra needs or questions. This home has had so many recent upgrades that it is practically a brand new home! Enter into the living room where you can see the Tom Benson Hall of Fame Stadium from the front windows. Hang out and watch the big game with your friends and family on our over-sized sectional and 55 inch smart TV. Netflix is also available and we have tons of movies! The kitchen will make cooking a breeze! Open shelving will never make you second guess where to find something. Brand new stainless steel appliances and a coffee station with complimentary coffee and tea. The kitchen opens up into the dining room that features a gas burning fireplace and book nook filled with books and games ready to be enjoyed. A full sized bathroom with a standing shower is off of the dining room and is also the bathroom for the master suite. The master features a queen size bed and a 40 inch smart TV. On the other size of the house you will find a full size bathroom with double sinks and shower/tub. The second bedroom features a queen size bed and the third bedroom features two bunk beds that are twin beds on top and full beds on the bottom. Downstairs is a pool table and a foosball table - just waiting for a friendly competition. There is also a hang out area where you can sit till it's your turn! Washer and dryer are also located in the basement and guests are welcome to use them. We have an enclosed patio room off the kitchen and just a step outside we have a patio table, chairs, umbrella, and grill. The yard is larger and the kids will enjoy throwing the football around or playing tag. The home also has a two car attached garage and parking that guests can take advantage of. The driveway can fit four cars. Step back in time to the golden age of small town America. This truly elegant 1920 Georgian Mansion was built by banker Charles Morgan. It is one of the original homes in the historic neighborhood of Ridgewood on the National Register of Historic Places. Construction began in 1920 and was completed in 1923. The home was meticulously restored in 2009; all modern necessities were added with great care to preserve the integrity of the original design. It is furnished with vintage pieces and museum-quality art. t's a time capsule of sumptuous comfort, and a creative haven for artists, travelers and executives visiting Canton. Located a mile from the Pro Football Hall of Fame, it's a 5 minute drive to downtown and thirty minutes from Amish Country. Guests have access to the entire house and gardens, except for the maids quarters on the top floor where the owner lives. The owner is an artist and there is a 1500 square foot studio attached to the house, and guests are welcome to visit when the studio is open. The Stone cottage is on a one acre strip of land and is the perfect romantic escape. It includes everything you need for an extended stay. It now has WiFi!! 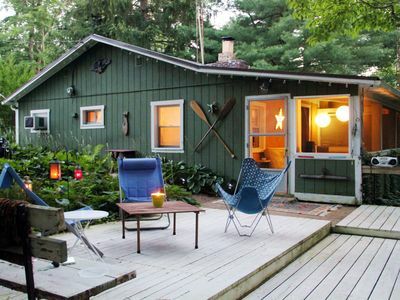 Complete with a full kitchen and one and a half baths this cozy cottage is the place to relax! Let your cares drown away as you take a hot jacuzzi bath and enjoy the sunset. Get our full country Breakfast cooked in our Amish neighbors kitchen and delivered right to your door for only 10.00 a plate plus tax. We also have a second property called the Loft. The loft has a pull in garage with three full rooms and a bath. It has two bedrooms with plenty of room to add cots in the other rooms. The living room also has a pull out bed couch. The Loft is in a large brick building and has its own garage that you can pull your car into. Climb the steps to a wonderful getaway which includes a full kitchen fully stocked, a full living room complete with a bedcouch and TV, and a romantic master bedroom adjoining the master bath complete with a jacuzzi tub. 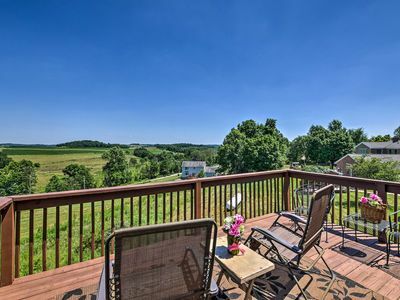 There is a private deck overlooking the quiet serene Amish farmland complete with patio furniture and a hot tub! This is a very family friendly place to stay and is situated a few hundred feet from our Brick home on our 10 acre lot in the country. A filling country breakfast is available for only 10.00 a plate and is hand delivered from our Amish neighbor ladies kitchen to your front door! A little farther down the lane is a second property that we own. The stone cottage is on a one acre lot by a pond. It has a master bedroom with a bath that includes a whirpool tub and shower. 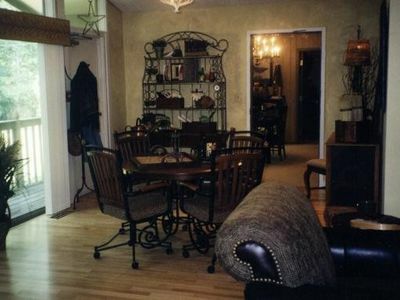 The main level has a full kitchen fully stocked and a small living room with a flatscreen TV. The upper level has a jucuzzi and tv with a half bathroom and overlooks the countryside. The perfect extended romantic getaway! Their is a separate listing for the cottage. Please go under the cottage listing to book the cottage since this listing will book the Loft. For only 10.00 a plate A big country breakfast is available from our wonderful amish neighbors Linda and Kara Mast upon request. 1800 sq ft 4br home! 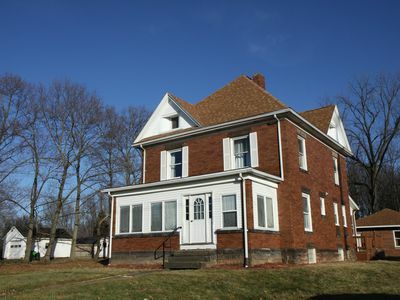 A beautiful house listing in Massillon, OH. Three full baths (one private attached to master suite) and four bedrooms. House is located: 16 minutes from the Pro Football Hall of Fame 18 minutes from Lehman's Hardware in Kidron 16 minutes from downtown Canton 40 minutes from downtown Akron 60 minutes from downtown Cleveland 23 minutes from Akron Canton Airport (CAK) 10 minutes from Paul Brown Tiger Stadium T-I-G! 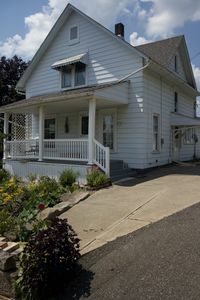 1.5 miles from the Ohio to Erie trail We have a beautiful, recently renovated 1916 home. Downstairs you will find a full bath, bedroom with king bed, fully remodeled kitchen, living room and foyer. Upstairs there is a full shared hall bath with two bedrooms that have queen size beds. Also a master suite with king size bed and attached full bath. 43" Smart TVs in every bedroom. You will have access to the entire second floor and the entire first floor. We are usually around, feel free to text me. 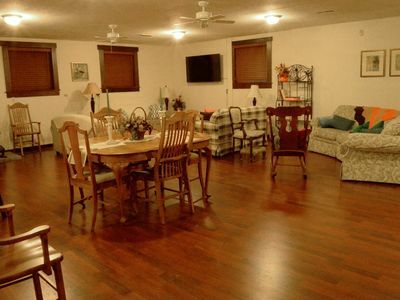 Originally an Amish Home, we have updated and remodeled the house into 3 separate units. This unit is a 2 BR, 2 BATH with a sleeper sofa . It includes 1 private bedroom(queen), 1 loft bedroom(queen) with a walk-in shower upstairs, and a sleeper sofa (queen) with a full tub /shower downstairs. This fully furnished unit also includes a full kitchen. Located in Wilmot on a main road(Rt. 62),we are surrounded by Amish neighbors. You can enjoy beautiful Holmes County and the Amish country as you relax outside. Located within 30 minutes of nearby shopping in Berlin. Or enjoy Walnut Creek Farm and David Warthers Museum in Sugarcreek. SORRY NO SUNDAY CHECK INS WITHOUT CHECKING WITH MANAGERS FIRST. Originally an Amish home, recently remodeled into units. 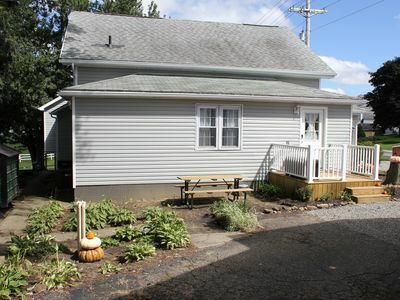 This unit is a 2 BR, 1 1/2 BA, with a private covered front porch with rockers. Master bedroom(queen) and full bath are downstairs and one bedroom(queen)(this bedroom is in the loft area of the house so the ceilings are lower (see pics)and 1/2 bath upstairs .Fully furnished kitchen with full size appliances , living and dining room combination. Also has a reading/office nook upstairs with a view out to the surrounding farms. Located on the main road(US 62), we are in the beautiful Holmes county and the Amish community. Located within 30 minutes of shopping in nearby Berlin. Or visit the Walnut Creek Farm or David Warthers Museum in nearby Sugarcreek. SORRY NO SUNDAY CHECK INS WITHOUT CHECKING WITH MANAGERS FIRST. 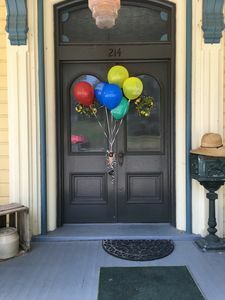 CHECK-IN TIME: 4:00 PM CHECK-OUT TIME: 11:00 AM ADDRESS: 2113 MAIN ST./US ROUTE 62, Winesburg, OH 44690 (for direction on how to find this address, please scroll down to "Location") Within minutes from Berlin, Sugar Creek, Millersburg, and Charm, Ohio, The Chestnut Barn is located in the heart of Amish country in the quaint and historic farming town of Winesburg, Ohio. Approximately 7 miles from the bustling tourist area (Berlin), the Chestnut Barn provides a true picture of Amish life in Holmes County. Surrounded by farms and rolling hills, long walks are a wonderful experience. Although our little town does not even boast a traffic light, you will be just steps away from the Winesburg Park which has a large playground and picnic pavilion. A few steps in the other direction is our historic general store. Not only will you find a deli serving Amish meats and cheeses, our general store also has a carry out which serves a varied menu that includes the area's most popular pizza, roasted chicken, and a full service ice cream shop. Amish restaurants and shops are just a short drive in any direction. Please be advised that even though it is quite a spacious house, it is not suitable for small children or the elderly. It is not handicap accessible. On the main (ground) floor the downstairs bedroom is one step down from the rest of the floor (not quite evident in pictures) and the shower room is also one step bellow the main level. For people using a walker or a wheelchair, we regret to inform you that unfortunately this is not an ideal property to rent. Located In the back yard of a c.1830 (chestnut) log house, this recently transformed barn has three bedrooms, two bathrooms, a giant kitchen and a great room which can be used for gatherings, seminars, or group meetings and fun get togethers. There are numerous sites to see and Amish country life to be experienced here in Holmes county all in the vicinity of this old barn with modern comforts and furnishings. 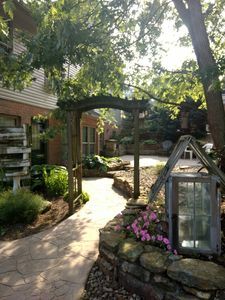 Located in the quaint village of Winesburg, just minutes from the heart of Ohio's Amish Country, the Stone Cottage Inn provides all the amenities of home in a peaceful small town setting. 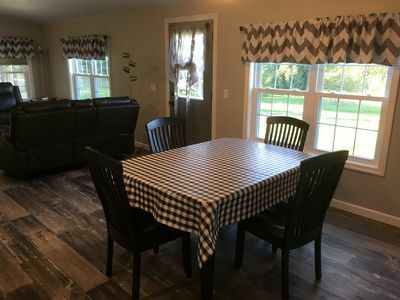 Two bedrooms, one loft, living room, dining room, fully furnished kitchen, laundry room, enclosed patio, and a finished out basement are just some of the things you will enjoy will staying at the cottage. 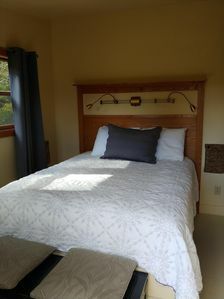 The cottage easily accommodates up to eight people (two queen beds, one full bed, and two twin beds). There is also a queen sized pull-out sofa bed in the living room and basement to accommodate four additional guests. A short stroll on the brick sidewalks of Winesburg will take you to the general store, pizza shop, ice cream parlor, antique store, post office, and the park. Monday through Saturday Check-in is anytime after 4:00 PM. (We do not accept new guest check-ins on Sundays so that our cleaning staff can attend church.) Check-out is anytime before 11:00 AM. In The Heart Of Amish Country, Mins From Walnut Creek, Berlin And Sugarcreek! Large, Peaceful Manor, Ideal For Families Or Friends With Spectacular Views. Miller Manor offers space, privacy, and comfort for all. Miller Manor is a stately and beautiful manor house that is nestled high on a hill with an unmatched view of the Walnut Creek valley. Once the residence of the town doctor and his family this elegant and luxurious country estate affords a once-in-a-lifetime opportunity to stay in a Georgian Manor. Large rooms adorn the manor and are filled with comfortable, elegant furniture and beautiful furnishings. The main floor features: two great rooms, one with a fireplace and a baby grand piano, den/office with sofa and ottoman, spacious and light filled living areas, master (king) bedroom and bath suite (features a Jacuzzi whirlpool tub) with an additional queen size sofa bed. 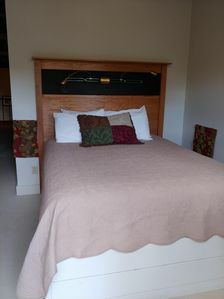 The master suite also features a private balcony with a beautiful view of the northern valley. Also included on the main floor is a fully equipped kitchen with a casual dining area and central island and stools with traditional and Keurig coffee makers, a formal dining room, two half baths, laundry room, amazing heated sunroom, and private patio access. Second floor features: two large (king) bedrooms each with an additional queen size sofa bed, two full baths, one bedroom with two single beds (which shares one of the bathrooms with the king bedroom), and a spacious sitting area with balcony access. 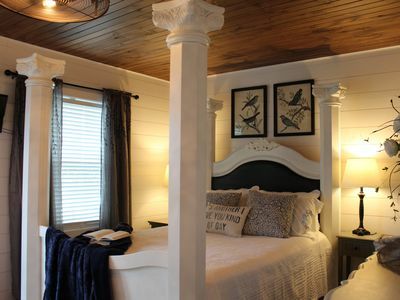 The lower level features one large (king) bedroom with two single beds and a spacious full bath. The lower level also offers various recreation options: home theater, ping-pong table, air hockey table, pool table as well as two treadmills and an elliptical. Two portable single beds are available onsite to provide additional sleeping accommodations when needed. The rear patio features a grill and outdoor furniture with an umbrella. There is an additional built-in gas grill located inside the large garage. All king bedrooms include new memory foam king mattresses and a TV/DVD with Dish satellite. The home theater has a TV/DVD with Dish satellite, which provides many viewing options including a small collection of popular DVD's to choose from. 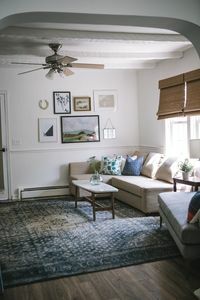 Large and comfortable common areas provide the perfect places for families and friends to gather, connect and fellowship. Outdoor recreation amenities include a tennis court and a two-hoop basketball court. The front courtyard features a gas fire pit with chairs. Guests of the Manor enjoy swimming privileges (off site) at the heated indoor pool at Carlisle Inn in Sugarcreek. This is the perfect location for sightseeing, shopping, walking or biking, playing golf in Sugarcreek and more. The Manor is the newest lodging property to be managed and operated by Carlisle Inn in Walnut Creek, Ohio. Romantic Vista Cottage - Walnut Creek, walking distance to restaurants, shops. 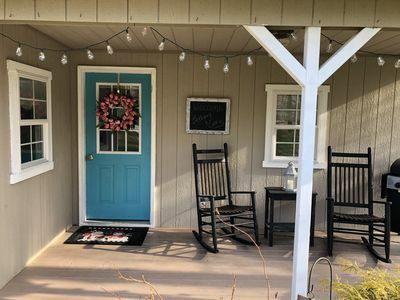 A beautiful, charming, stand alone cottage located right in Walnut Creek, Ohio, It is within easy walking distance (3 minutes) to Der Dutchman Restaurant, Rebecca's Bistro, Yoder Hardware and other shops. 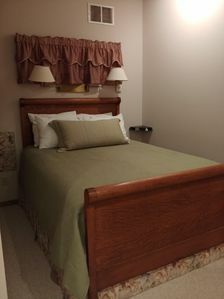 The cottage includes a kitchenette, small table for eating, reclining love seat, bedroom, bathroom, and deck with beautiful views, overlooking the Cove, Wallhouse Hotel and Route 39. We invite you to be our guest and relax in our charming, quaint little cottage. Just sixty steps to the sandy beach from your new vacation favorite! Beautiful, quiet fishing lake. Motors up to 9.9 horsepower permitted so no roaring, racing boats--just tranquility as kayaks, paddleboards, fishing boats and an occasional pontoon boat pass by. All linens provided--others charge $50 for sheets and towels or you bring your own and start your vacation by making beds--UGH! Even worse, you travel home with smelly laundry and worst of all, when you get home, you have several loads of laundry to do! We even provide the beach towels. Smoke-free gas firepit All new construction All new furniture and beds in 2012! Every bed a queen or king Two large covered patios and a huge private patio for sunbathing 1 1/2 baths, one features a two-person walk-in shower AND a full size soaking tub Fully equipped kitchen with full-size stove, refrigerator, dishwasher and disposal and all cooking equipment, place settings and more. Forget something? We also supply individual packages of condiments, a large assortment of spices, Reynolds aluminum foil, Glad plastic film, zipper food storage bags, even popcorn and marshmallows for the firepit! Free high-speed WiFi Internet Great Room with trouble-free seasonal gas fireplace and 50 inch Television with Blueray DVD Player Den overlooking lake with electric fireplace and 32 inch television and DVD player New washer and dryer Current edition magazines including People, Reader's Digest, Architectural Digest, Time, The Week, Car & Driver, Popular Mechanics and more. This is what a guest wrote about her family's November 2018 visit: First off I want to start by saying how amazing the area is. I've traveled to many places but this area really gave me butterflies. if you love the country side area you will love going there. and as soon as you enter the neighborhood you'll see the lake and just be amazed on how beautiful everything looks. it's like living in the park that you love most. and the best part is that this house is the only house that actually has a beach on the lake and it's gorgeous. the INSIDE of the house is just like it's out of a family movie. the decorations is so warm and makes you feel like you're really away and you'll keep discovering things. the view of the lake was amazing of the lake from the house. best place to enjoy coffee in the morning. and one of the things that SHOCKED ME is how nice people were when we went to stores around the closest store is 7 minutes away it has everything in it and there's also a one stop. George and Linda, take care of everything and responsive. Best place ever and no review nor photos are describing enough. definitely I'm going back. Go and enjoy the best of life. This house is completely renovated and updated. Located 10 minutes from the Pro Football Hall of Fame and other local attractions, it features new flooring, appliances, windows, and kitchen. A large back yard is perfect for pets or a simple game of football. Visitors will have access to the entire home including all bedrooms, kitchen, basement, and large back yard. We live next door and will be available to help or assist immediately with any issues that arise. Of course we'll respect your privacy and do not require interaction except for check-in and check-out. The house is furnished with most necessities, but if there's something specific you will need please feel free to ask. 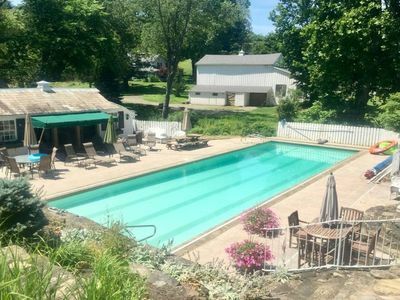 Located in the heart of Amish country, our guesthouse is a newly-renovated ranch house 5 minutes from Berlin with all its cool shops & dining, and 3 minutes from Walnut Creek which is known for Der Dutchman Restaurant, Rebecca's Bistro, and more! Bring your family and enjoy a home away from home! Relax in our spacious living room or sit around the fire on our patio out front! Rainbow Hills Winery offers a beautiful bed and breakfast that boasts privacy in the hills where nature abounds. Enjoy a true getaway from the fast-paced world with 4 guest bedrooms with queen beds, private balconies, private bathrooms in each room, air conditioning, large fireplace room with satellite TV, coffee bar in the lounge room and beautiful architecture hardwoods from the property throughout. Rainbow Hills Winery offers a beautiful Bed and Breakfast that boast privacy in the hills where nature abounds. Enjoy a true getaway from the fast-paced world with 4 guest bedrooms with queen beds, private balconies, private bathrooms in each room, air conditioning, large fireplace room with satellite TV, complimentary coffee bar in the lounge room and beautiful architecture hardwoods from the property throughout. Welcome to Main Street Cottage! It is a lovely place to pause and soak up life with those you love. It is central to all the best Amish Country stops. Located between Lehman's Hardware and Berlin. Walk down the street to our local bulk food store the Red Tomato. Or hop in the car and visit Lehman's Hardware, voted best destination in Amish Country. Start your day off with the delicious buffet at Mrs. Yoder's Restaurant in Mt. Hope. Or head in the other direction and enjoy some good Amish cooking at Amish Door in Wilmot. Drive 10 minutes further to the village of Berlin, home to dozens of pop-up shops and stores rich in Amish culture. Spend the day browsing the quilts of Helping Hands, the crafts of Sol's Palace and the trinkets of Lena's House. End the day with a world-famous pie from Boyd & Wurthmann! This house is located off of Rt. 250 which is a fairly busy road.